Alopecia areata (AA) is an autoimmune medical condition in which hair is lost from some or all areas of the body, usually from the scalp. In 1-2% of cases, the condition can spread to the entire scalp (alopecia totalis) or to the entire epidermis (alopecia universalis). Commonly, alopecia areata involves hair loss in one or more usually round shaped spots on the scalp. Alopecia areata is not contagious. It occurs more frequently in people who have affected family members, suggesting that heredity may be a factor. Strong evidence that genes may increase risk for alopecia areata was found by studying families with two or more affected members. An unknown environmental trigger or a major life event such as trauma, illness, pregnancy or emotional stress is thought to combine with hereditary factors to cause the condition to manifest. 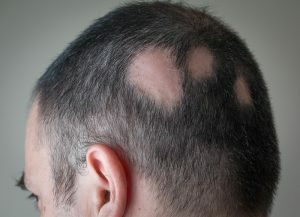 Typical first symptoms of alopecia areata are small bald patches. The underlying skin is unscarred and looks superficially normal. These patches can take many shapes but are most usually round or oval. Alopecia areata most often affects the scalp and beard but may occur on any hair-bearing part of the body. Different skin areas can exhibit hair loss and regrowth at the same time. The disease can be unstable and may also go into remission for a time, or permanently. The hair tends to fall out over a short period of time, with the loss commonly occurring more on one side of the scalp than the other. The condition can be unstable and go into remission either permanently or for a limited period. Different affected areas can also show hair loss and regrowth at differing times. Hair loss is often rapid and tends to affect one side of the scalp more than the other. Anyone concerned with, or managing, adverse hair loss needs clarification and options to address their condition. Advanced Hair Studio offers a complimentary advanced hair check at every one of our 70 plus studios around the world. You can rely on our 45 years’ experience to help you understand what options are available to manage your hair loss. Every case is unique, and the consultation will involve a discussion of your medical history to see if there is an underlying medical condition prompting the disease that requires a referral to an Advanced Hair Studio hair loss doctor. You may also benefit from other medications and treatments that prompt the regrowth of hair. These procedures are solely for the re-growth of hair and won’t prevent the development of new bald patches. Our Stem Cell Hair Technology Factors is particularly useful for alopecia areata sufferers. Please note that any sudden or abnormal hair loss may be a side effect of a medical condition; hair is often a barometer of an individual’s health. Individuals may also need to be referred to a medical specialist. You can be one of the 500,000 people that have benefitted from Advanced Hair Studio’s industry-leading procedures. You’ll appreciate the care we show you, and the way we combine this care with breakthrough technologies that help you to reverse alopecia areata hair loss.